National Electrical Code (NEC) Section 318-11 Ampacities of Cables, Rated 2000 Volts or Less, in Cable Trays. (b) Single Conductor Cables allows cables of identical construction and conductor material to be operated at different maximum ampacities depending on the physical placement of the cables in ladder or ventilated trough cable trays. NEC Section 318-10 Number of Single Conductor Cables, Rated 2000 Volt or Less, in Cable Trays. (a) Ladder or Ventilated Trough Cable Trays. Doesn’t cover the width requirements of ladder or ventilated trough cable tray for all the types of installations that contain single conductor cables. This is best exhibited by cable tray width calculations for three different examples of single conductor cables in ladder or ventilated trough cable tray that are permitted by NEC Article 318. The examples are based on installations that contain 12 – 500 kcmil cables (four – three phase – 480 volt circuits or a circuit of four paralleled conductors per phase). The 500 kcmil copper single conductor cables have 600 volt 75 degree centigrade insulation. The cable’s diameter equals 1.07 inches and the cable’s area equals 0.90 square inches. Example #1 is based on the requirements in Sections 318-10(a)(2) and Section 318-11(b)(2). Section 318-10(a)(2) states that the sum of the cross-sectional areas of the single conductor cables shall not exceed the allowable fill area in Column 1 of Table 318-10 for the appropriate ladder or ventilated trough cable tray width. Table 318-10 – Column 1 shows that the minimum cable tray width that has adequate fill area is a 12 inch wide cable tray. The 12 inch wide cable tray has an allowable fill capacity of 13.0 square inches which slightly exceeds the installation’s 10.8 square inch requirement. Section 318-10 states that the single conductors or conductor assemblies shall be evenly distributed across the cable tray. This statement leaves the exact cable arrangement in the cable tray up to the designer. Following are two examples of installations that meet the intent of Section 318-10. The cable installation shown in Figure 1A is technically superior to that shown in Figure 1B. The installation of the cables in the cable tray as per Figure 1A is very desirable as the cables are in an arrangement where they are equilaterally spaced. This will result in equal reactances for the circuit’s phase conductors. If each of the phase conductors has the same resistance and reactance, the currents to and the phase voltages at the utilization equipment will be balanced assuming that all the loads are balanced three phase loads. Motors that are supplied with unbalanced three phase voltages experience additional heating due to the voltage unbalance. A few percent voltage unbalance can be very detrimental to the length of the motor’s operating life. For the Figure 1A and Figure 1B installations, the allowable maximum operating ampacities (Table 310-17) for the 500kcmil conductors is 620 Amperes x 0.65 = 403 amperes per conductor (without the use of a maximum ambient operating temperature correction factor). Example #2 is based on the requirements in Section 318-11(b)(3). Section 318-11(b)(3)states that where single conductors are installed in a single layer in uncovered cable trays, with a maintained space of not less than one cable diameter between individual conductors, the ampacities of Nos. 1/0 and larger cables shall not exceed the allowable ampacities in Table 310-17. Section 318-11(b)(3) defines the arrangement of the cables in the cable tray to obtain the conditions that allow the cables to carry the higher ampacities. Section 318-11(b)(3) contains permissible ampacity information and it also contains information that impacts on the cable tray width selection. If the width of the ladder or ventilated trough cable tray is selected based on the requirements of Section 318-10 for a installation being made as per Section 318- 11(b)(3), the cable tray will be of insufficient width for the intended installation. To determine the required width of a ladder or a ventilated trough cable tray as per Section 318-11(b)(3). Space between cables must be equal to one cable diameter — 11 x 1.07 inches = 11.77 inches. Total cable tray width required is 12.84 inches + 11.77 inches = 24.61 inches. A 30 inch wide cable tray must be used. For Figure 2 installations, the allowable maximum operating ampacities (Table 310-17) for the 500kcmil conductors: is 620 Amperes per conductor (without the use of an maximum ambient operating temperature correction factor). This cable arrangement will result in some unbalance in the phase currents and voltages due to the fact that the cables are not equilaterally spaced. The distances from the conductor centerlines of the Phase A to Phase B and from the Phase B to the Phase C are equal but the distance between centerlines of the Phase C conductor to the Phase A conductor is larger. The reactances for the three phases will not be equal which will result in the currents to and the phase voltages at the utilization equipment being unbalanced. If the circuits are of a length where it is possible to transpose the phase conductors, the reactances of the phase conductors can be equalized. Two transposition would allow each phase conductor to occupy each of the three conductor positions for 1/3 of the length of the run. For very long runs, it may be desirable to have many transpositions but regardless of the number of transpositions each phase conductor must occupy each of the three conductor positions for 1/3 of the length of the run. This type of installation can only be made where the cables can be terminated without entering raceways (The ampacities in Table 310-16 must be used if the cables enter a raceway). Examples would be at a transformer secondary or at a bus extension from switchgear. It is best to use the 75 degree C ampacity values even if a 90 degree C insulated cable is installed unless it is known that the equipment can accommodate the termination of the higher temperature conductors. For the Figure 2 installation, the 90 C insulated conductor operating at its maximum ampacity will produce 27 percent more heat than will the 75 C insulated conductor. See NEC Section 110-14(c).Temperature Limitation. Example #3 is based on the requirements in Section 318-11(b)(4). Section 318-11(b)(4) states that where single conductors are installed in a triangular or square configuration in uncovered cable trays, with a maintained space of not less than 2.15 times one cable diameter between the cable groups, the ampacities of Nos. 1/0 and larger cables shall not exceed the allowable ampacities in Table B-310-2 in Appendix B of the NEC. Section 318-11(b)(4) defines the arrangement of the cables in the cable tray to obtain the conditions that allow the cables to carry the higher ampacities. So Section 318- 11(b)(4) contains permissible ampacity information and it also contains information that impacts on the cable tray width selection. If the width of the ladder or ventilated trough cable tray is selected based on the requirements of Section 318-10 for a installation being made as per Section 318- 11(b)(4), the cable tray will be of insufficient width for the intended installation. To determine the required width of a ladder or ventilated trough cable tray as per Section 318-11(b)(4). Space between cables must be equal to 2.15 times one cable diameter — 3 x 2.15 x 1.07 inches = 6.90 inches. Total cable tray width required is 8.56 inches + 6.90 inches = 15.46 inches. An 18 inch wide cable tray must be used. For Figure 3 installations, the allowable maximum operating ampacities (Table B-310-2) for the 500kcmil conductors is 496 amperes per conductor (without the use of an maximum ambient operating temperature correction factor). 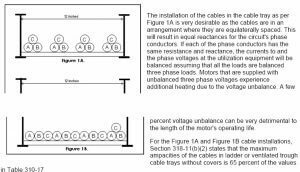 The installation of the cables in the cable tray as per Figure 3 is very desirable for the reasons stated concerning Figure 1A. This type of installation can only be made where the cables can be terminated without entering raceways. The ampacities in Table 310-16 must be used if the cables enter a raceway. It is best to use the 75 degree C ampacity values even if a 90 degree C insulated cable is installed unless it is known that the equipment can accommodate the termination of the higher temperature conductors. For the Figure 3 installation, the 90 C insulated conductor operating at its maximum ampacity will produce 37 percent more heat than will the 75 C insulated conductor. See NEC Section 110-14(c). Temperature Limitation. When utilizing cable tray to support cables, the designer has cable installation arrangement options available which allow the same size cables to operate at different ampacities if the appropriate cable tray width is selected. The maximum allowable ampacity for the 500 kcmil cables installed as per Figures 1A and 1B is 403 amperes – (12 inch wide cable tray). The maximum allowable ampacity for the 500 kcmil cables installed as per Figure 2 is 620 amperes – (30 inch wide cable tray). The maximum allowable ampacity for the 500 kcmil cables installed as per Figure 3 is 496 amperes – (18 inch wide cable tray).